I love shoes. And handbags. And perfume. And.... you know how this goes. Quite a long time ago I spotted shoes from Sarah Jessica Parker's line - SJP that I would love to own. I could think of a ton of different ways to wear them and really enjoy having them in my wardrobe. Although I'm sure I could find the size to fit, the price doesn't fit in my budget right now. Whenever this happens to me - when I find something I love but cannot afford - I am inspired to find a similar item that would fit in my budget or save save save to buy the item I do want (see post from last week regarding whether to buy or not). I gather my inspiration by figuring out what attracted me to the item in the first place. So, back to the shoes. I love: the sparkle, the square heel, and the color of the shoe. I was picturing myself in these shoes with some jeans and a cute top for a night out. I had me in the shoes with a little black dress for a party. I was wearing the shoes with my wide-legged black pants many different ways. The idea I love the most is pairing something more casual with something more dressy or sparkly and I knew these shoes would be perfect. I also try to follow my own advice so I just kept the idea in the back of my head for a time when I might spot an pair of shoes that would come close. 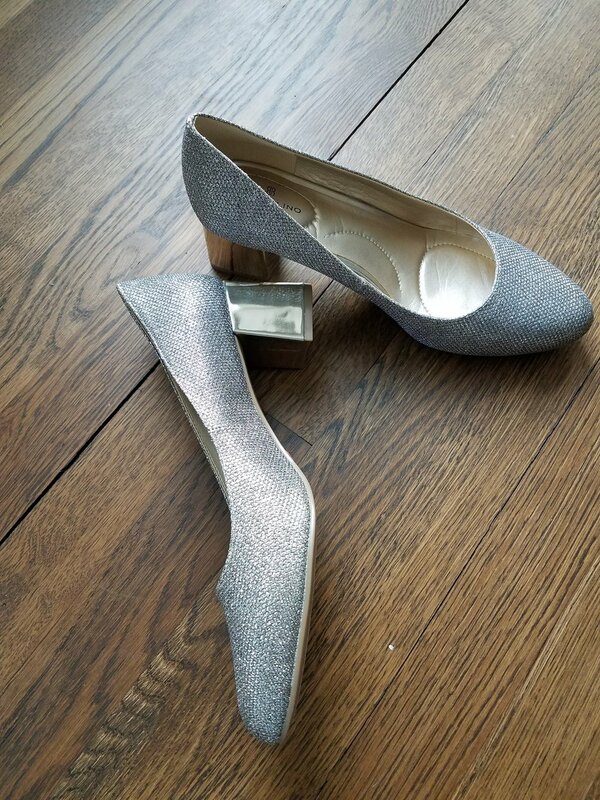 This pair is silver, has some sparkle, and the square heel. These are from Bandolino, a great brand available widely at several retailers. They are not the SJP level of quality and all (obvi) but they are still awesome. If you are a shoe lover and specifically a lover of the SJP brand you know the shoes are made in Italy, leather (usually including the sole), exceptional detail and hardware, and the trademark grosgrain ribbon adorns the backstay of every pair. I do own the SJP Carrie in black and love that shoe. Once again, I digress. Back to the sparkles I found at TJMaxx. the shoes were my size and seemed like a "sign". I tried them, they fit great. The best part? THEY WERE ON CLEARANCE FOR $15 bucks!!! Come on! So, they are mine. I will wear them much the way I have planned to wear the inspirational SJP pair. I will wear with my jeans, dress them up with a little black dress, maybe with my pretty full pink skirt I love, with my black pencil skirt and with my cropped wide-legged pants. I was actually set with an outfit for today, but alas it's raining so that's not happening today. Finding something that inspires you to add that to your wardrobe to fit your style is what it's all about. What's inspiring you these days??? I would love to hear about it. So, I'm trying a Style Link Up - let's see how this goes. I love a community of women building each other up and all of us talking about how we each own our style.